“I want to go to a lot of colleges, but the one I want to go to the most is Springfield College. We recently sat down with Jarien, a football-loving fourth grader who always has a smile on his face. Jarien’s teacher, Ms. McGregor describes him as a polite and motivated scholar who is a great friend to his classmates. He is also one of Springfield Prep’s Student Ambassadors. The school’s Student Ambassadors develop new leadership, communication, and presentation skills, in part by leading school tours to visitors. We wanted to learn more about what life is like as a Springfield Prep scholar and here's what he shared with us. What do you like about going to school at Springfield Prep? You get to learn different things than in other schools. We have long recess. I love that we have a half day on Fridays because we work really hard during on the rest of the days. Oh, and I love the Principal. She’s really cool. What’s the best thing about your teachers? The best thing about my teachers Ms. Berube and Ms. McGregor is that they are funny and awesome. When we get an answer right, the whole class does something cool like a dab or something. It makes me feel good when the whole class is happy for me. My favorite subject is Math because we get to learn about different numbers. Decimals are my favorite. I think I like Math and they don’t because they don’t know the true meaning of Math. The true meaning of Math is all about fun and learning. It will make things easier for me in high school and college. Where do you want to go to college? I want to go to a lot of colleges, but the one I want to go to the most is Springfield College. I went there on a field trip and the food was awesome. They have free jelly donuts with sprinkles! I also want to go there because I want to be close to my family. I would want to live at home because my house is right next to the college. I’m so close I can see the dorms from my front door. Are there other colleges that you've thought about? I’m thinking about going to Western New England University because Mr. Johnson went there. Their mascot is the Golden Bear and I think that would be cool. How do you learn about colleges? I research about colleges at school and at home. We went on field trips to some colleges and I really liked them so I did research at home. I want to be a Police Officer because I get to save people. I’m really good at Fortnite and I love football. My favorite team was the New York Giants, but now it is Cleveland Browns because that’s who Odell Beckham Jr. plays for. I even dyed my hair to look like his. Thanks for sharing Jarien! We know you’ll do great at whatever college you ultimately choose. But until then, we’re glad we get to spend more time with you at Springfield Prep. Springfield Prep Charter School is proud to announce that Fourth Grade Teacher and Grade Level Chair Brittanie McGregor has been selected by the school as its 2019 Pioneer Valley Excellence in Teaching Award Winner. The Excellence in Teaching Awards program, made possible by the Harold Grinspoon Charitable Foundation in partnership with MassMutual and the Irene E. & George A. Davis Foundation, is an honor given out annually to recognize outstanding Western Massachusetts educators. Brittanie will be recognized at a banquet for Excellence in Teaching Award Winners at the Log Cabin in Holyoke on Wednesday, May 1st. Brittanie has taught at Springfield Prep for three years, and taught in the Springfield Public Schools prior to that. At Springfield Prep, she has taught “founding grades” for three consecutive years and was the Founding Grade Level Chair for two of them. In this way, she has had a tremendous impact the growth and success of our newest grade levels. 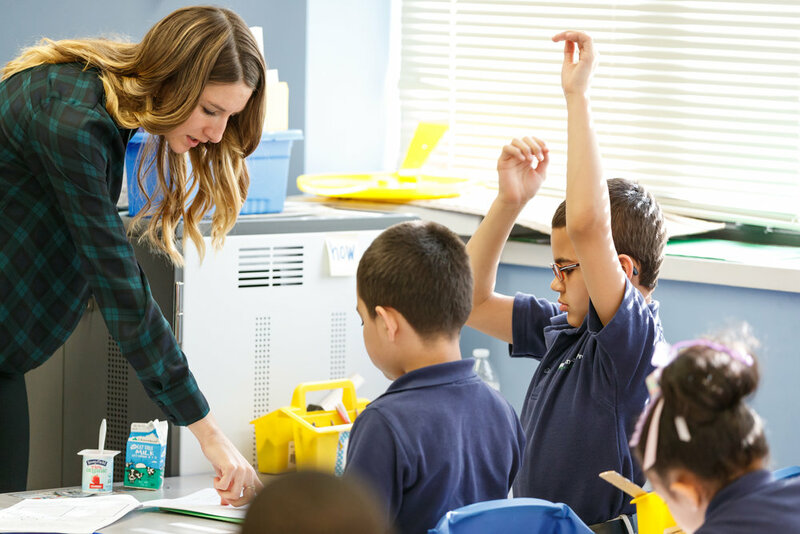 Under Brittanie’s leadership as a Third Grade Teacher and Grade Level Chair, Springfield Prep’s third grade students were among the highest performers in the state on the MCAS during the 2017-2018 school year. Step inside Brittanie’s class and it’s immediately apparent what makes her unique. Hands shoot up when she asks a question about the text and students are eager to share. Motivating quotes adorn the walls. She subtly guides students back to the text when they struggle to answer a challenging question, clear about what she wants her students to glean but cognizant of the fact that they will grow the most when they are doing the work as independently as possible. Ms. McGregor will be honored along with other awardees from the region at a banquet for Excellence in Teaching Award Winners at the Log Cabin in Holyoke on Wednesday, May 1st. "I like to think of the entire Operations team as the "backstage crew" of the school...Every day is different for me, and there is never a dull moment!" 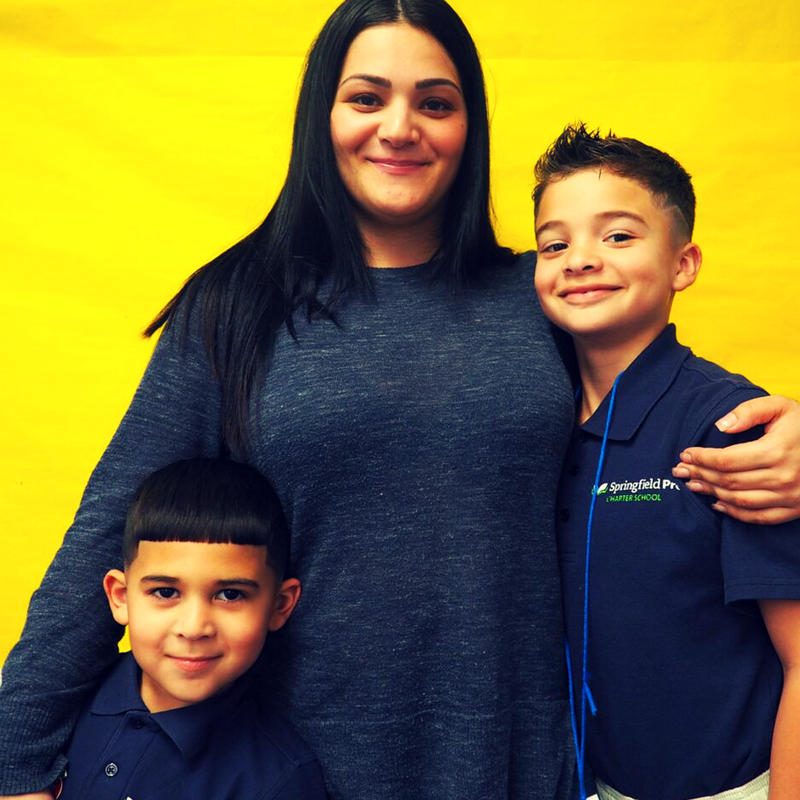 Ms. Vazquez has been with Springfield Prep from the very beginning, and that's no exaggeration! She was the first employee hired by Mr. Spirer - back when Springfield Prep was just a collection of cubicles, and not yet a school! She has been an instrumental and invaluable part of Springfield Prep's success, and has helped Springfield Prep grow to it's current size, with 4 grades, 216 students, and 36 staff members. For many, she is the first person they meet when they walk into the school, and she is always there to help when a family needs it. Because of this, she knows every student (and most of our parents!) by name. Go ahead, quiz her! We promise she'll get them all right. We sat down with Ms. Vazquez to get her thoughts on Springfield Prep's growth over the years. Here's what she had to say. Why do you enjoy working at Springfield Prep? We truly have the best staff, the best families and most importantly, the best kids. Not a day goes by without me getting hugs or pinky waves from the kiddos. What makes Springfield Prep unique? Springfield Prep is unique because we focus on college, and we speak to our scholars about the options they will have after high school, starting when they are in kindergarten. I think it is so important for our scholars to learn about different schools and the options they'll have so that they are prepared once they are in high school and understand the process of applying to college. What has it been like to see Springfield Prep grow from an idea to the school it is now? I started off as the first employee for Springfield Prep, working from a table outside of Mr. Spirer's cubical (in a rented office space) trying to make our first lottery happen. It's such a great experience to now see classrooms full of actual children learning, moving up in grades and building relationships with other students and staff. What’s one of your favorite Springfield Prep memories? One of my favorite memories is the first field trip we took as a school back in 2015. We planned a fall field trip to McCray's farm to pick pumpkins and EVERYONE in the building was able to attend! It was one of those unique experiences we were able to have as small, young school. The only downside of our growth is that it makes full-school events more difficult to plan. They're still my favorite though! You’re pretty close with many of our families. What do you hear from parents about their children's experiences at SPCS? I get positive feedback from parents all the time, and I never get tired of hearing, "thank you to everyone for caring about my child" and "my kids love you and this school". 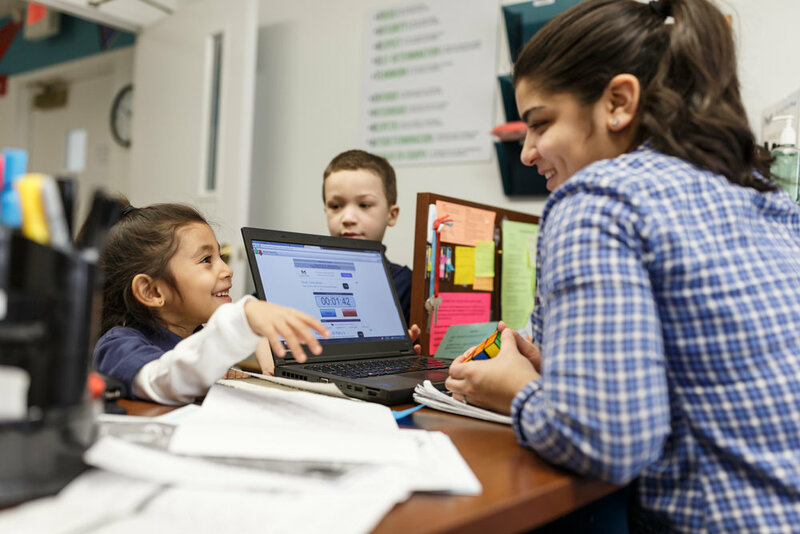 Parents have expressed that their children look forward to coming to school now that they attend Springfield Prep, and that they are seeing positive changes in their children's behavior at home because of all the great work our teachers and staff are doing here. What are you excited about when it comes to Springfield Prep’s future? I can't wait to see our first class of 8th-grade scholars graduate! At Springfield Prep we believe in all of our scholars, and I know they are going to go on to do great things. I know "Operations" is a pretty general term for what you do. What's something you wish people knew about your role at Springfield Prep? I like to think of the entire Operations team as the "backstage crew" of the school. We run the front desk, plan field trips, coordinate testing, do community outreach during enrollment season, communicate with families through calls/texts/flyers and so much more. Every day is different for me, and there is never a dull moment! On Saturday, February 3rd, a group of Springfield Prep staff members joined nearly 200 runners and walkers in the Coldest Day 5K. The race, which benefits the Springfield Rescue Mission, is an annual event that seeks to bring attention to the realities homeless individuals face during the winter. "Our school is right down the street from the Rescue Mission, and it's important to us that we do what we can to give back to the community and show our support for the organizations serving our neighborhood" said Ms. Wagner, Director of Finance and Operations. (Ms. Wagner also came in 2nd place for the female runners!) "Plus it's a great way for us to be visible in our neighborhood and let people know about the work we are doing with our scholars." 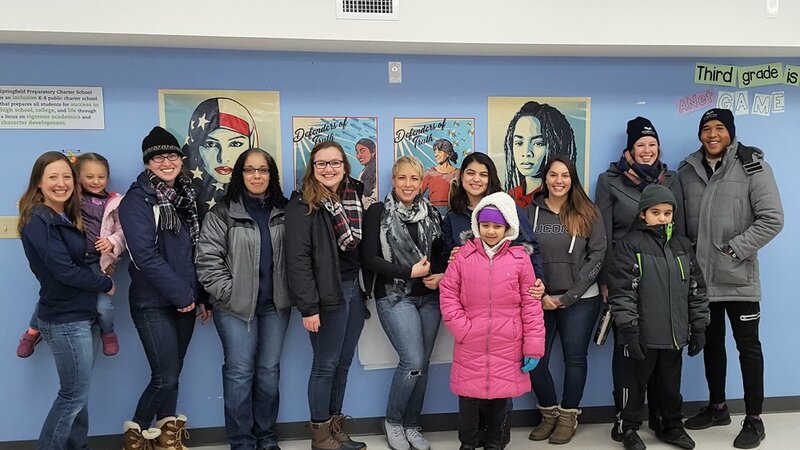 The day's fun continued with Springfield Prep's annual Community Walk, which aims to bring awareness about the school to families who may be interested in enrolling their children. "A key part of our school's mission is to be open and accessible to all students," noted Ms. Wagner, "and going door to door with applications is a powerful way to get the word out about our school." Despite the cold and windy weather, 12 teachers, staff members and family members offered up their afternoon to walk around Springfield neighborhoods and spread the word about Springfield Prep. Overall, it was a great day of teamwork and community building. We're so thankful for our #SpringfieldPrepFamily, and we can't wait for our next event! 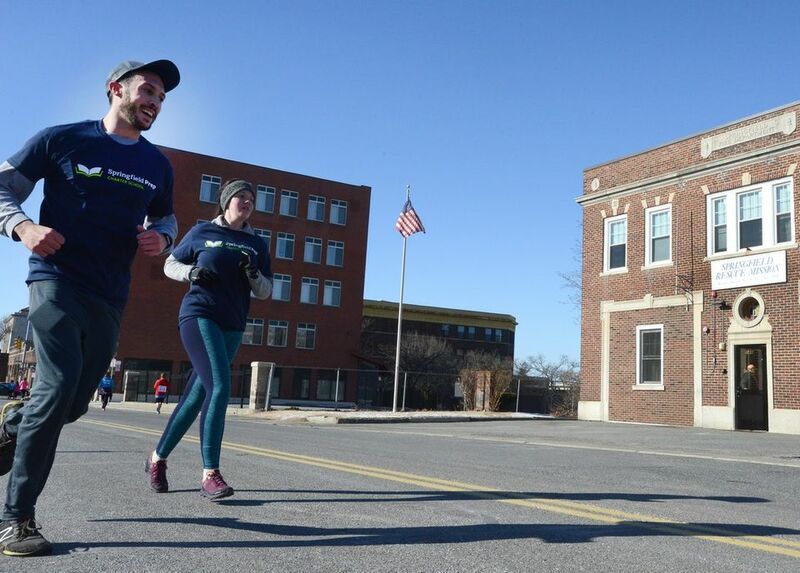 To see more photos of the Coldest Day 5K check out Masslive's article here. On Friday, December 22nd, Springfield Prep held its third annual Winter Concert at the St. John's Congregational Church. It was an exciting event - all students performed and more than 500 family members and friends were in attendance. Under Mr. Naylor's leadership and direction, our students put on quite a show! A show like this doesn't come together overnight. Under the direction and leadership of Mr. Naylor, students worked for over three months, rehearsing until they had their songs and choreography just right. (They even practiced in their pajamas during Spirit Week!) Our scholars hard work paid off, and they performed a mix of seasonal and hit songs for a full house of family and friends. 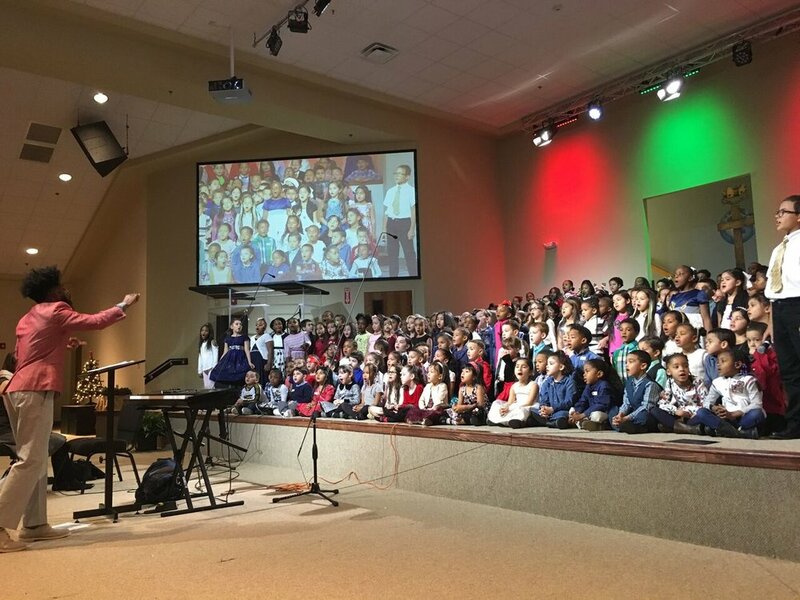 To kick-off the show, students in all grades joined each other on stage for a rendition of "Season of Hope", followed by our kindergartners singing a spirited version of "Christmas Makes Me Sing!". 1st grader Antonia melted hearts with her performance of "How Far I'll Go" from Disney's "Moana", followed by 2nd graders singing "Esta es la Navidad" and 3rd grade singing "Heri Za Kwanzaa". A show like this is a great way to demonstrate our "Teamwork" Core Value and it was evident in the preparation and performance. Our scholars worked together on choreography and vocal performance, supported each other during the performance, and celebrated their friends for their extraordinary performances. The event closed with an all-grades performance of "It's the Most Wonderful Time of the Year" (and even some of the teachers couldn't help but sing along!). It was the perfect way to send off our scholars for winter break, and to see our entire Springfield Prep Family all in one place. We can't wait to see what they do this spring for our End of Year Celebration! "Our mission is urgent and you can feel that powerful urgency in every single classroom." When Mrs. Mitchell first interviewed to be a teacher at Springfield Prep, everyone who met her said, "Wow, she has such incredible positive energy - let's hire her!" And that first impression hasn't changed. Step inside Mrs. Mitchell's (and Ms. Shaw's) UMass classroom and you can't help but notice a calm-but-purposeful, positive-but-no-nonsense vibe. Our kids are very lucky to have her. We wanted to hear from her what she values about teaching at Springfield Prep and what makes her job unique. It is perhaps unsurprising that her responses reflect the positive spirit that has become her hallmark. Why do you enjoy working at Springfield Prep? I enjoy working at Springfield Prep because I am supported by my coaches and colleagues. It is impossible to pour out of an empty cup - because my "cup" is constantly poured into at work, I am able to serve our students. I also enjoy working at Springfield Prep because I see awesome teachers living out our school’s mission on a daily basis. Our mission is urgent and you can feel that powerful urgency in every single classroom. What makes Springfield Prep unique? From the moment I walked into Springfield Prep, I have felt the joy of teaching and learning. Springfield Prep is unique because it is made of up a body of professionals who are honest about our day-to-day challenges but also determined to come up with an efficient solution. What's one of your favorite teaching moments? My favorite teaching moment is when one of my students have their own "a-ha moment". During this moment, all of the planning, preparation and hours of professional development are balled up into one simple "A-HA"! What does it take to get students to that moment? Relentless work, lots of professional development, monitoring progress frequently in class - it's not one thing, it's all of them. It's keeping the bar for students high and not giving up until they reach it. How do you involve families to help their kids be successful in school? Class Dojo has helped a lot - we share lots of pictures and videos on Class Dojo to help parents see what kids are doing. This really helps parents to be invested in the work we do here. We also have an open door policy, so families often drop by and see what's going on. Our families are great - they frequently ask what else they might be able to do to support their children's development. What do you hear from parents about their children's experience in school? This past parent teacher conference, multiple parents expressed how happy their kids are to be here, which feels so great, especially knowing that we have an extended school day. When we talked about Thanksgiving Break, they asked "are you and Ms. Shaw coming?" Families know that we expect a lot from their kids, but they say that their kids really like to be challenged - that's what we see too! What makes Springfield Prep different from some of the other schools you've worked? It's the tone - every challenge is met with positivity. Our standards are rigorous but it never feels like we can't achieve it. This is because we scaffold a lot - we meet the kids where they are and we slowly build until they meet that point. We first got to know Kerriann Suliveres three years ago when she enrolled her son Alex as a kindergartner. You could tell right away that she had big aspirations for her sons - she was always helping them do their best and made it clear to them that excellence in school was her priority. As Alex grew with us, we got to know his little brother Jerry and were thrilled when he joined us as a kindergartner this year. True to form, Kerri Ann had Jerry practicing his sight words all summer and he was ready to go when school started. We've always appreciated Kerriann's openness with us: she's kind enough to frequently tell us how much the school has meant to her boys, but she also shares ideas for how we can improve the school. We were eager to hear more about life as a Springfield Prep parent and learn about her, and her sons', experience as members of the Springfield Prep family. What made you choose Springfield Prep? There are a lot of reasons. The learning system is much more advanced. I have a lot of peace of mind. I know I can drop my children off and they are cared for every day. I don’t have support at home, and the discipline here has really helped me because the school really does their part. My kids are much more respectful and responsible now. Springfield Prep has changed our lives - it’s helping me raise my kids. What impact has Springfield Prep had on your kids? Once Alex started here, 3 months later, he was reading to me. And now Jerry is reading full books, too. He pronounces words amazingly. He was not reading at all before he came here, now he is coming in at the top of his class with his heart words and reading words. I can’t believe how much he knows! We know that we have very high expectations for our students. Is that ever a challenge for you or your sons? No, I may have wondered about it at some point but now I know what my kids are capable of. It never feels like too much pressure, just that the expectations are high, which is good! For Alex, I was worried about him liking math, and then "bam!" I saw how much he could do - he was like a math wizard. For Jerry, I wondered if he would struggle with reading, which came really naturally to Alex, but now he's doing an amazing job and reading so much. What is your favorite thing about Springfield Prep? The people. They make me feel comfortable, and offer help when I need it. A teacher gave him a ride home once and when I couldn't drop my kids off, the school called an Uber. The school is super helpful. I love you guys! For parents who are thinking about enrolling their children at Springfield Prep, what would you want them to know? I'd want them to know that they work individually with our children, that they make sure everyone gets lots of attention, that they're really structured, and that the work is more advanced than at some other schools... and that it's free! What makes Alex and Jerry's teachers so good? (We are biased, but we think we have some of the best teachers around.) Oh my god, there are so many things! They're understanding, they're trustworthy, they're open to any conversation. They're lovable, they're sweet, they're kind, they're tough when they have to be tough, in a proper manner. They're such great teachers, I don't even know how to explain it. Where do you find them?? 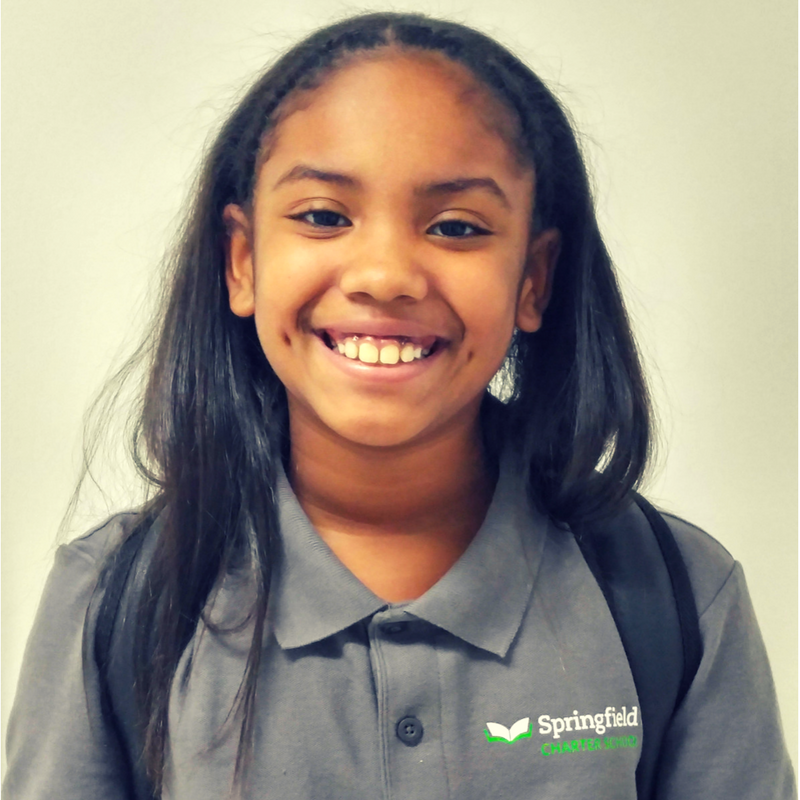 "Springfield Prep has the best teachers in the world"
We sat down recently with Jaeda, a third grader who started Springfield Prep as a "founding" first grader three years ago. Jaeda brings a big smile and a positive outlook to school everyday, and is an amazing teammate to her friends. You'll see Jaeda's picture on our Scholar of the Week board and might find her sitting at her class's "VIP" table, reserved for scholars who embody the school's core values. We wanted to learn more about what makes life special as a Springfield Prep scholar and here's what she shared with us. And even though she may not be famous at this point (see her comment below), we're confident that it's only a matter of time! What makes Springfield Prep a great place to go to school? First, that’s a really easy question! Springfield Prep has the best teachers in the world, lots of learning time, and I always get a lot of exercise which helps me focus. Also, people here are very friendly - everyone is friends with each other and people don't get picked on. I also like the books we get to read. For example, I just read Charlie and the Chocolate Factory and it helped me understand the story much more than the movie did. The book makes the story come to life in your head. What’s the best thing about your teachers? That’s a really hard question... there’s too much to say! Ms. Mac teaches us science, and she always makes it fun. Ms. McGregor is always helping us do our best, and they both make homework fun. We get to do lots of reading, and I love reading. What’s your favorite subject? I really like science and math. A lot of kids say "I don't like math." Why do you think you feel differently? Oh my goodness - who says that?!? I feel differently because the better you are at math, the easier it is to do more challenging problems. And I like science because we get to learn about animals and we get to do experiments, which is really fun. Where do you want to go to college? NYU! Why? Mostly because I like Bobcats. I like their mascot! Are there other colleges that you've thought about? Well, maybe Westfield - it depends on its mascot. How do you learn about colleges? Mostly from this school. We get to visit colleges, Last year we went to Westfield State. I really liked it - it was huge. What do you want to be when you grow up? I’m still working on that, but maybe a teacher or a doctor. Doctors can help kids feel better if they're sick. And teachers get to help kids learn. Anything else you want to share? Does this interview mean I'm famous? Springfield Prep is an inclusive, K-4 (growing to K-8) public school for Springfield students. Our mission is to prepare all students for success in high school, college, and life.